It means, first, that everything that appears in public can be seen and heard by everybody and has the widest possible publicity. For us, appearance—something that is being seen and heard by others as well as by ourselves—constitutes reality. Compared with the reality which comes from being seen and heard, even the greatest forces of intimate life—the passions of the heart, the thoughts of the mind, the delights of the senses—lead an uncertain, shadowy kind of existence unless and until they are transformed, deprivatized and deindividualized, as it were, into a shape to fit them for public appearance. The most current of such transformations occurs in storytelling and generally in artistic transposition of individual experiences. But we do not need the form of the artist to witness this transfiguration. Each time we talk about things that can be experienced only in privacy or intimacy, we bring them out into a sphere where they will assume a kind of reality which, their intensity notwithstanding, they never could have had before. The presence of others who see what we see and hear what we hear assures us of the reality of the world and ourselves, and while the intimacy of a fully developed private life, such as had never been known before the rise of the modem age and the concomitant decline of the public realm, will always greatly intensify and enrich the whole scale of subjective emotions and private feelings, this intensification will always come to pass at the expense of the assurance of the reality of the world and men. Indeed, the most intense feeling we know of, intense to the point of blotting out all other experiences, namely, the experience communicable of all. Not only is it perhaps the only experience which we are unable to transform into a shape fit for public appear­ance, it actually deprives us of our feeling for reality to such an extent that we can forget it more quickly and easily than anything else. There seems to be no bridge from the most radical subjec­tivity, in which I am no longer "recognizable," to the outer world of life. Pain, in other words, truly a borderline experience be­tween life as "being among men" (inter homines esse) and death, is so subjective and removed from the world of things and men that it cannot assume an appearance at all. Since our feeling for reality depends utterly upon appearance and therefore upon the existence of a public realm into which things can appear out of the darkness of sheltered existence, even the twilight which illuminates our private and intimate lives is ultimately derived from the much harsher light of the public realm. Yet there are a great many things which cannot withstand the implacable, bright light of the constant presence of others on the public scene; there, only what is considered to be relevant, worthy of being seen or heard, can be tolerated, so that the irrele­vant becomes automatically a private matter. This, to be sure, does not mean that private concerns are generally irrelevant; on the contrary, we shall see that there are very relevant matters which can survive only in the realm of the private. For instance, love, in distinction from friendship, is killed, or rather extin­guished, the moment it is displayed in public. ("Never seek to tell thy love / Love that never told can be.") Because of its in­herent wordlessness, love can only become false and perverted when it is used for political purposes such as the change or sal­vation of the world. What the public realm considers irrelevant can have such an extraordinary and infectious charm that a whole people may adopt it as their way of life, without for that reason changing its essen­tially private character. Modern enchantment with "small things," though preached by early twentieth-century poetry in almost all European tongues, has found its classical presentation in the petit bonheur of the French people. Since the decay of their once great and glorious public realm, the French have become masters in the art of being happy among "small things," within the space of their own four walls, between chest and bed, table and chair, dog and cat and flowerpot, extending to these things a care and tenderness which, in a world where rapid industrialization constantly kills off the things of yesterday to produce today's objects, may even appear to be the world's last, purely humane corner. This enlarge­ment of the private, the enchantment, as it were, of a whole people, does not make it public, does not constitute a public realm, but, on the contrary, means only that the public realm has almost com­pletely receded, so that greatness has given way to charm every­where; for while the public realm may be great, it cannot be charming precisely because it is unable to harbor the irrelevant. Second, the term "public" signifies the world itself, in so far as it is common to all of us and distinguished from our privately owned place in it. This world, however, is not identical with the earth or with nature, as the limited space for the movement of men and the general condition of organic life. It is related, rather, to the human artifact, the fabrication of human hands, as well as to affairs which go on among those who inhabit the man-made world together. To live together in the world means essentially that a world of things is between those who have it in common, as a table is located between those who sit around if, the world, like every in-between, relates and separates men at the same time. The public realm, as the common world, gathers us together and yet prevents our falling over each other, so to speak. What makes mass society so difficult to bear is not the number of people involved, or at least not primarily, but the fact that the world be­tween them has lost its power to gather them together, to relate and to separate them. The weirdness of this situation resembles a spiritualistic séance where a number of people gathered around a table might suddenly, through some magic trick, see the table vanish from their midst, so that two persons sitting opposite each other were no longer separated but also would be entirely un­related to each other by anything tangible. 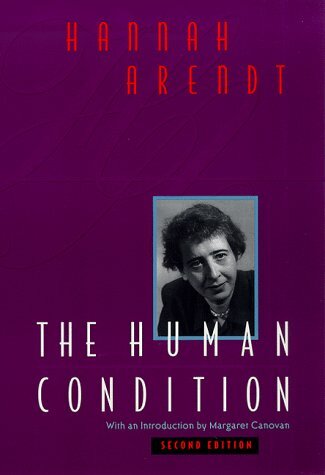 The Human Condition, The University of Chicago, second edition, 1998, pp.50-53.